What kind of front is shown? A warm air mass is caught between two cooler air masses. What kind of front does the diagram represent? A warm air mass overtakes a slow-moving cold air mass. What type of front forms when an active cold front overtakes a warm front, producing a complex weather pattern? Which front is represented by this diagram? 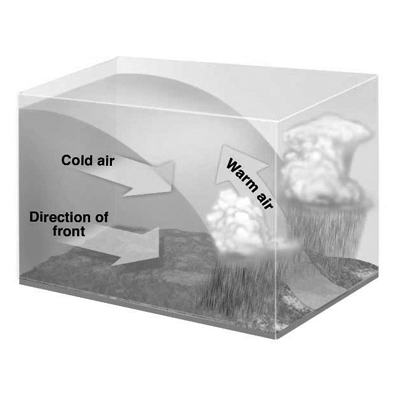 Forms when a warm air mass meets a cold air mass and no movement occurs. What would the following symbol indicate on a weather map? What kind of front forms when a warm air mass catches up to a cold air mass? A front formed when a cold air mass moves into territory occupied by a warm air mass is called a(n) . A fast-moving cold air mass overtakes a warm air mass is what? A warm air mass overtakes a slow-moving cold air mass is what? When a warm air mass is caught between two cold air masses. 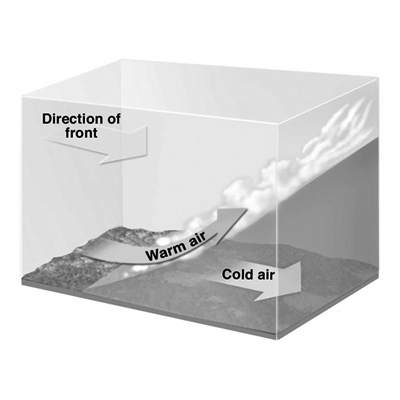 The forward edge of a warm air mass is a . A warm air mass meets a cold air mass and no movement occurs. Where should a coefficient of "2" be placed to balance the equation? When a fast moving cold air mass overtakes a warm air mass and pushes the warm air above the ground, a/n forms. When a cold air mass and warm air mass meet in the middle and just stay there, a/n forms. 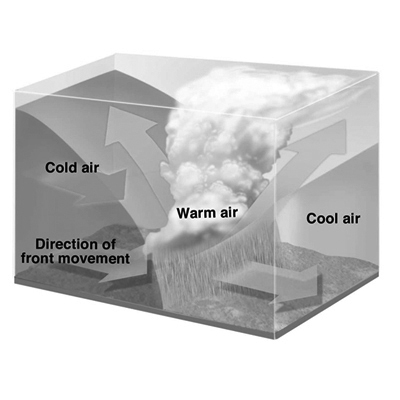 When a fast-moving warm air mass moves onto a slow moving cold-air air mass, a forms.